An introduction to Viking movies; why they are not just another subgenre of historical epics or pure fantasy, and what lies behind the genre name. Some of you probably like fantasy films, or historical epics, or action films about ancient kings going to war, or cheesy 1980s barbarians-invading-sword-and-sandal emperors, or cool characters like Tarzan and Red Sonja and Kull, big franchises like Lord of the Rings…. Here’s the thing – mix all that and you get: Viking movies! One would think that most countries with a movie industry would churn out Viking movies on a regular basis, considering how popular other film genres with the above ingredients have been the last 20 years. Not so! In fact, looking at all the action-adventure-fantasy genres, Viking films probably come last in terms of quantity and reputation, in spite of having the potential to offer everything people love in their films. 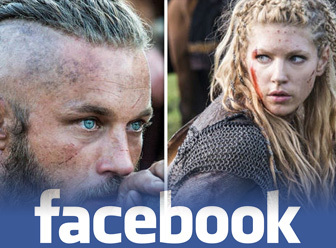 This underrated genre has its fans, and the fans now have VikingMovies.info as their specialized source of information! Underrated? Even movie fans struggle to mention more than five Viking movies, let alone five good Viking movies. Viking films – the few that exist – may have a bad reputation, but nevertheless they are often great fun and offers a way to explore themes in a raw and imaginative way that is rooted in reality, not fantasy. Usually, a movie about wild fur-clad savages that throw axes, burn down churches and steal women will have to be fantasy movies like Conan the barbarian or Conquest. Great as they are, they are pure fantasy (although often inspired by Viking mythology), whereas Viking movies are always based on actual history. Granted, many Viking films either border on fantasy or cross over to fantasy completely, and most of the genre’s films take huge liberties in terms of historical accuracy, but there is still that core of truth, confirmed by archeologists and historians. This makes Viking movies different – they are reality based adventure/action/fantasy movies. Unfortunately, the genre is so small that there are even people who don’t know what or who the Vikings were, so here’s a quick introduction. Around 1000 years ago, the Northern-most areas of Europe (known today as the Nordic region) were not divided in countries. Those cold and distant mountains, fjords and forests were populated by people who were farmers, fishermen, hunters, traders and craftsmen. Local clans, kings and lords divided the land between them. Around the year 790, the northmen created a new business; raids on more or less distant neighbours. The first recorded raid was in 787 in Dorset in England, while others count the attack on Lindisfarne in 793 as the start of the Viking age. With ocean-going longboats, they murdered, raped, stole and burned through Ireland, England, France, Germany, Italy, Russia, wherever they could travel. Actually, that is not all they did, but their history was written by their victims, which is why Vikings have a bad reputation rivalled only by the movies about them. The Viking age lasted only a few hundred years, from the 8th century to around 1100. The battles at Stamford Bridge and Hastings in 1066 is often seen as an end of the Viking era. While Viking raids and the laws and culture of the northmen existed before and after this period, one usually limits the Viking age to this period due to defining events that were documented. Centuries later, Vikings would become the symbols of Scandinavia; Norway, Sweden, Denmark and Iceland take pride in their Viking history. Barbaric business aside, Vikings were also brave adventurers who discovered Iceland, Greenland and North America, and traded with civilizations as far away as North Africa and the Middle East. 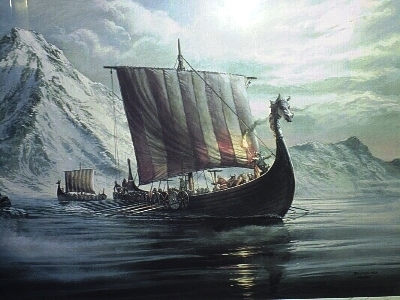 The word “viking” is difficult to translate from its original meaning; it could mean “a raider at sea” or “a journey”. Naturally, authors and movie producers have tapped into this rich and exciting culture, and created books, TV and movies more or less based on actual events, historical people or the culture itself. Let’s not be hypocrites about it; most Viking movies can not be taken literally, as they are too fictional and take great liberties with historical accuracies. Some movies have one leg firmly in history and the other leg in fantasy, but that is perhaps because everything about the Vikings kickstart the imagination so much? It’s not really a surprise that the biggest fantasy classic of all times, Tolkien’s Lord of the Rings, was heavily influenced by Viking mythology and culture. The fact remains; you cannot really know exactly what, how, and why Vikings acted. A lot of the content that can be seen in the movies could potentially have happened. If you forget about aliens, monsters and time-travel, Viking films are about real people, not about superheroes or magical worlds. Part of the fascination lies in how all the adventures could have taken place. Unlike, say, the adventures of Sinbad that clearly are made up in someone’s imagination, and must remain in fantasy land. The first Viking movie is believed to be The Viking (1928), a story about how Erik the Red discovered Greenland, East of Iceland. It was also the first colour movie to have a complete soundtrack. Since then only a few dozen Viking movies have been made, including the ones that cross over into fantasy or is based on legends that are similar to Viking stories, such as Beowulf adaptions. Right here at VikingMovies.info we’re trying to maintain a complete list of all the movies that has been made, and as you can see, the number of titles are increasing. Viking movies can roughly be divided into four categories; the realistic, the fantasy based, the reversed perspective ones, and comedies/children’s movies. Many films place themselves in two or more categories. The realistic ones features no dragons, otherwordly beasts or magic. They focus on either actual history, or things that could physically and mentally happen in the Viking age. The White Viking (1991) is an example of that, with its story about Scandinavia turning into Christian territory towards the end of the Viking age. Possibly the most famous Viking film, The Vikings (1958) with Kirk Douglas and Tony Curtis is also in this category, even if the historical accuracy fails. At least they battle eachother, not aliens or monsters as in fantasy based Viking films, a relatively new subgenre. 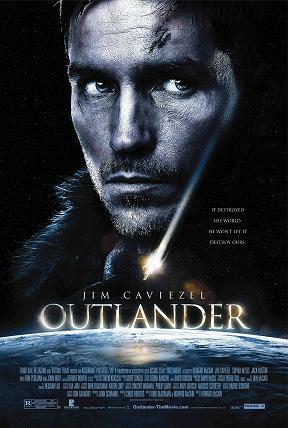 Island at the top of the world (1974) is an early example, but in later years we have had big-budget films like Outlander (2008) and Beowulf (2007) that threw new and much needed fuel onto the Viking fire. Strictly speaking, Beowulf is not really straight Viking material, but many adaptions place Beowulf and Grendel in a Viking setting, and the poem itself does take place in Viking era Scandinavia. The third category, reversed perspective Viking films, deals with Vikings from the perspective of non-Vikings, such as their victims or the consequences of Viking raids. Alfred the Great (1969) is a well known example, and Asterix and the Vikings (2006) could be said to belong to that category, as well as being an animated movie mostly aimed at children. Vikings are more often that you’d think featured in children’s entertainment, although usually highly exaggerated and simplified. 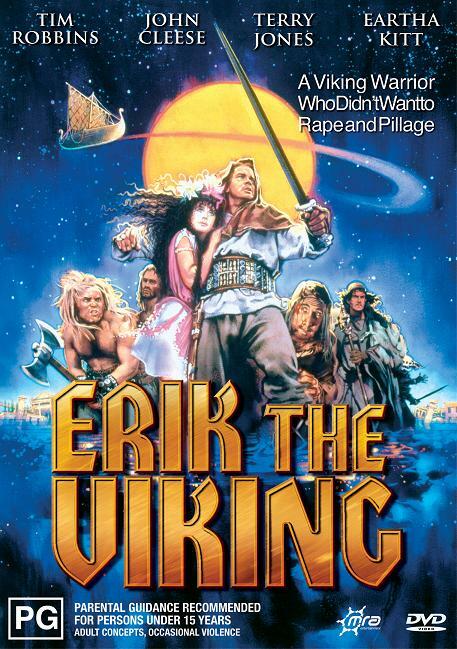 Some adult comedies are treasures though, like Erik the Viking (1989), starring some of the Monty Pythons. In Sweden, the sitcom Home to Midgard (2003) was aimed at adults, so there are all sorts out there. Here at vikingmovies.info we’ll eventually write about all sorts of Viking films and TV shows, from the silly ones made in Turkey via BBC documentaries to “real” Viking films made in Scandinavia. We will also cover the outskirts of the Viking genre, such as the Arn trilogy which is set after the Viking age or movies that include Vikings but not as the primary characters. Would you like to contribute? Feel free to contact us.